1) The device is most likely the Thermal Controller of the Z97 PCH. On some systems the BIOS hides that device, but AIDA64 will re-enable it in order to provide PCH Diode temperature readout. 2) Several ASRock motherboards use a poorly implemented fan muxing mechanism that is unsupported by AIDA64. On your particular motherboard that effectively means that only one of the CPU fan headers can be monitored by AIDA64. However, the rest of the fan headers should be available on the Sensor page of AIDA64, albeit they may be labelled differently, like System fan or Aux fan. If they're not there, then please right-click on the bottom status bar of AIDA64 main window --> Sensor Debug --> ISA Sensor Dump. Copy-paste the full results into this topic. 3) The video card fan issue is most likely because even after the fan is stopped, your GPU still reports the last fan RPM for whatever reason. It could be a VBIOS issue or a GPU pecularity. We can check what's going on, but in order to do that, we would need to see how the GPU registers look like when the fan is not spinning, and also when it is spinning. So if it's possible, please issue an ATI GPU Registers dump for both states, by right-clicking on the bottom status bar of AIDA64 main window --> Video Debug --> ATI GPU Registers. Copy-paste the full results into this topic. Thanks for the reply! Is there a way to eliminate the entry in device manager? Not sure why but I'm not able to paste anything in this reply so I'm including the debug info in a text document. I have three chassis fans and chassis fan #2 is not showing up in AIDA 64. All three chassis fans show up in the bios. 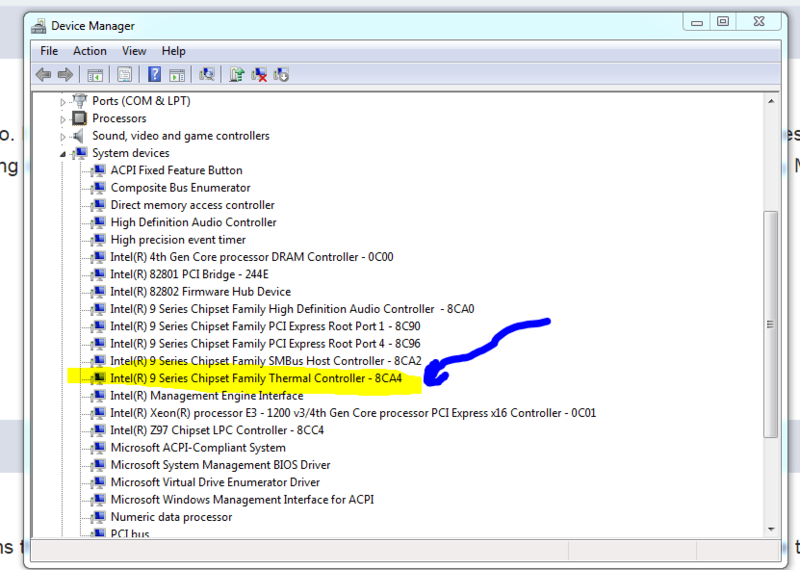 Device Manager: You can try re-installing Intel chipset software package, it may help. But, if the device is still there, you don't have to worry about it. It doesn't bring any useful functions to Windows, but it also doesn't require a driver to be installed. Chassis fans: Thank you for the data. Please note that the 3rd chassis fan is already there on the Computer / Sensor page of AIDA64, it's just called Power Supply fan. We will fix the labelling issue in the next AIDA64 beta update. Video card fan: Thank you for the data, but we need 2 different dumps, one for the fan spinning state, and another for the fan stopped state. So we could compare the registers output to see where the catch is. I was wondering if the PSU fan rpm was actually my other chassis fan rpm. Thanks for the clarification. I'm sorry for not getting the other dump info on my graphics card. I will do that after I get home from work. Here's the dump for the fan spinning state. I used MSI after burner to start the fan. Thank you for the dumps. As I've suspected, it is a GPU pecularity. Your GPU reports a valid, non-zero fan RPM measurement even when the fan is driven at 0% duty cycle, so when it's basically instructed to stop. We'll implement a workaround to show 0 RPM when the duty cycle is 0%. It will be included in the next AIDA64 beta update due in a few days from now. Perfect! All is well now. Thank you for the feedback, I'm glad it works fine now. I did have a question though. I used the zip file and just unzipped everything into my AIDA64 folder and just replaced the files as it asked me. When I was done, my shortcut always asked me if I wanted to run the exe each time. Is that normal? I finally just took the check mark out of "ask me each time." I know what popup you meant. 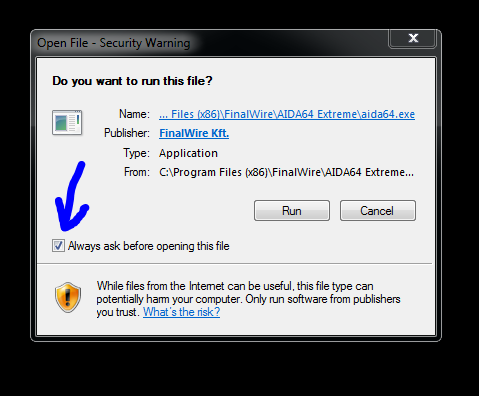 I was talking about a different window, the one that is the Properties box of the AIDA64.EXE file that you can access in File Explorer after right-clicking on AIDA64.EXE. 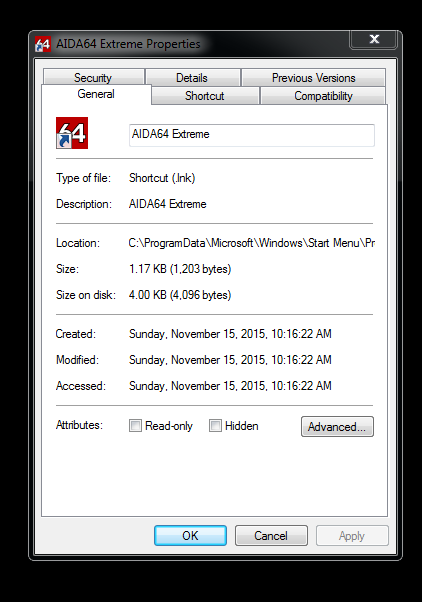 You don't have to start AIDA64 to access that window.